With this very easy to use vat calculator, you can easily add vat. 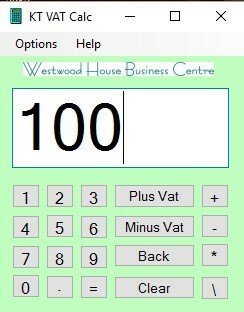 By press the ADDVAT button again it will show you the VAT amount, press again and it shows you the total, etc. You can also minus the VAT, and use the keyboard instead of the buttons for faster use. The arrow keys become the ADDVAT and minus vat keys. KentTec, made tailor made programmes for you. All our programmes are always simple to use, and can always be altered to your needs. The software is all in house and does not rely on any external sources or licenses. KentTec is a firm believer in simple to use software. KentTec also have a collection of software packages that are highly useful within office and keeping everything organised and up to date. KentTec now offer a fully functioning database that can be tailored to suit the needs of you company. Our database allows you to store all the records of your clients, customers and staff to produce letters, mail merges, emails, reports and more. With the KT Database you will have a central system that stores every interaction you have with a client or staff member, current and new, and all users can have their own secure log in to the system. For £700 you could have your own fully equipped database with as many fields and laid out how ever you would like it, with unlimited users. For more information or a demo please contact us. For office use we have some useful software, such as the KT Messenger, which allows you to dispense with those post it notes, and send messages to your colleagues quickly and easily, knowing that the message is safely logged for future reference and guaranteed to get to its recipient. 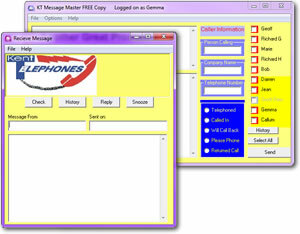 This software is so quick and easy to use and runs on your local lan. 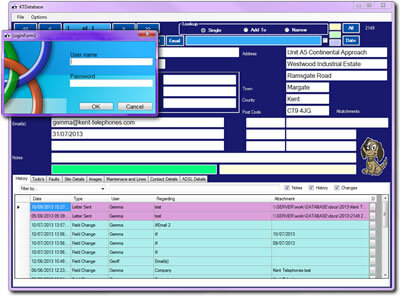 The KT Diary is an easy to use central system, that can be easily accessed by all members of staff at any computer within the network. With the diary you and your colleges can book in appointments, events or jobs under the name of the college it is regarding. As we write all our own software in house, no job is too large or small, so bespoke software can be written to your requirements.